We’re thrilled to hear that Territori 24, the Barcelona-based architecture and urbanism firm cofounded by one of our faculty members Bet Alabern, has won the competition for a civic center and retirement home in the neighborhood of Baró de Viver in Barcelona’s Sant Andreu District. The proposal, based on sustainable principles and the optimization of the available economic resources, integrates a space for collective farming open to the facility users and the surrounding community. The project implements renewable energy resources and evaluates environmental aspects that span the entire cycle of the project’s construction process. Efficiency measures include the use of materials like a lightweight but resistant metallic mesh for the internal structure that allows for quick assembly and an exterior skin of lowcost prefab concrete and dry-assembled windows. All organic waste produced by the farm will be reused and composted on site. “This competition has allowed us to work on various themes we were personally interested in one single project; social sustainability, coefficiency and the exploration of materials,” explains Bet Alabern. We look foward to seeing the project underway in the near future! 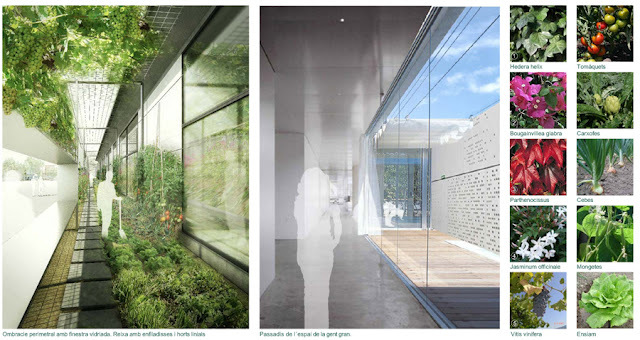 Visit the project description and plans at Territori 24 (in Catalán) and at HIC Arquitectura (in Spanish).